Energy in sculpted form, 1181 Queen Street West stakes its claim in a provocative, innovative symphony of metals, glass, and brick. In dramatic escalating torque, the structure rises to broaden its sway, overseeing one of the world’s vital communities. 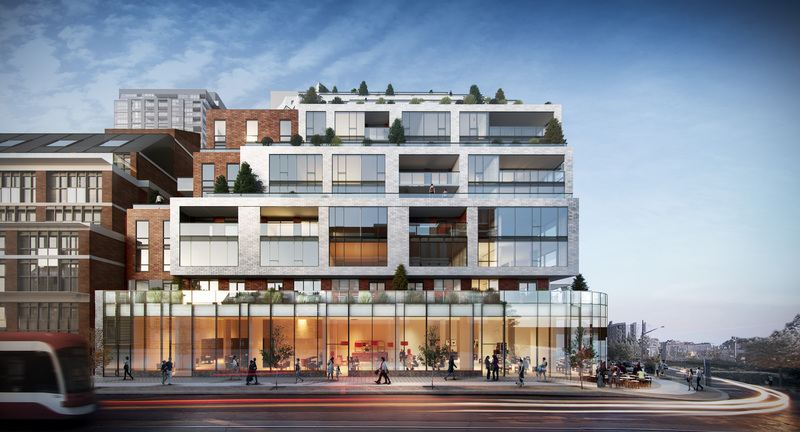 1181 Queen West stands boldly as the gateway to a neighbourhood that defines itself on defying convention. Its intricate design challenges perception of depth and stance. Discover gleaming glass elegantly framed by cool, silver-grey stone. Here, each level assumes its own form, commanding its own space: set-back, thrust outward, and eventually angled into dramatic leading edges on the upper levels. VIP Broker sales are currently underway, and the developer is offering my clients VIP pricing for a limited time. 1181 Queen West Condos is a boutique building with only 112 units, and 15 storeys high. VIP Pricing starts at $549,900 for a 546 sq ft one bedroom unit, and ranges upward to $2,159,900 for a 1,662 sq ft three bedroom plus den penthouse. Parking spaces are $65,000 (available for 2 bedroom suits 800 sq ft and larger), and lockers are $7,500 extra. Estimated occupancy is Spring 2021.